On an intercity bus ride a few nights ago, I woke from a sleep to overhear two strangers chatting in the dark about fantasy novels. I gathered one was a theology student, and the other had worked for a church. They seemed super-humanly earnest. They discussed C.S. Lewis ("wonderful!") and J.R.R. Tolkien (not so wonderful), both agreeing that The Lord of the Rings was "hard going" and "like history". The whole scene reminded me of this week's chapter: a nocturnal journey, a hushed conversation, a hidden eavesdropper. In At the Sign of the Prancing Pony, the hobbits arrive in the town of Bree and try to evade the pursuit of the Black Riders. But before the action begins, Tolkien administers a heavy dose of background information: the architecture of Bree, race-relations in Bree and ancient migration patterns. No wonder some readers find this "hard going" and "like history". Other readers (like myself) eat this stuff up with a spoon. De gustibus something something something, as dear old dad likes to remind me. But the strangers' conversation pointed me to a larger question. The Lord of the Rings contains so much lore -- but what is it missing? It is missing a lot. We can see this from the description of Bree in the present chapter: "In those days no other Men had settled dwellings so far west, or within a hundred leagues of the Shire." The lands are empty. There are no people. Middle-earth generally, and especially the northwest, is severely depopulated. Bree and the Shire (which only have a few thousand people between them) appear to be the only settlements between Rivendell and the Grey Havens, a distance of about 500 miles (or the distance between Paris and Berlin). Indeed, we're told in the first sentence of this chapter that the lands are "empty" -- and this dominating wilderness is a huge theme in The Lord of the Rings. But this depopulation not very plausible, whatever the cause. It's not how humans work: we fill up spaces, especially nice temperate spaces like north-west Middle-earth. For example, even after the Black Death carried off 25%-33% of the population of Europe, recovery was swift, with "prompt" economic, agricultural and political recovery. And although the population took a long time to fully bounce back, Europe did not become a wasteland. So, on the one hand, we have a complex society (a postal network, inns and trade) but no way of resolving disputes, no authority figure, not even a local warlord (until Sharkey comes along). Frankly, this is freakish. In the world as we know it, prosperous villages can't spend hundreds of years in harmonious anarchy. Although there were some self-governing communities in the medieval world, they were not stable or long lasting (even Iceland had its chieftains and a complex system of government). The absence of any state in northwest Middle-earth is not plausible. There is no church. The topic of religion in Tolkien is fascinating, and probably deserves its own post. Here I'll simply say that devotion, ceremony and even faith are absent from The Lord of the Rings. There are no houses of worship, no clergy not scriptures. Nothing in the Shire, and nothing here in Bree. So far, the closest we've gotten to the Supreme Being is when Merry cries out "Lawks" (i.e. "Lord!") in Chapter 5 as he sees what a mess Pippin is making with his bath. This is a huge rupture with the way that humans generally behave. Before modern times, no human society existed without some form of spiritual belief. And the Middle Ages were especially bananas for religion. At the heart of every medieval village and town was a church with its steeple rising into the sky. This was an age "drenched in mysticism", with religious belief impregnating every aspect of life. I don't mean any of this as a critique. After all, Tolkien was writing a fantasy novel. He's entitled to bend reality as much as he pleases. And by leaving out these elements, Tolkien is able to focus on things he really cares about: the Edenic existence of hobbits in the Shire or the vastness of the wilderness (to give two examples). I just want to point out how fantastic Middle-earth really is. It's nothing like our world as we know it, and certainly nothing like medieval Europe. To conceive of a temperate continent without a thriving population, without a state, and without any religion is an act of pure imagination, more audacious than giving us elves, dragons and magic swords. Indeed, it's a mental leap that many Tolkien fans have trouble making. You see this especially in role-playing or computer games set in Middle-earth. In an effort to make the game more digestible, the lands fill up with little cities and local potentates, or characters take on classes like priests and animists. I can understand this from a game-play perspective, but sometimes these extraneous works distract us from Tolkien's unique vision. Middle-earth is a strange place with strange absences that make it nothing "like history." To read on, here is my commentary on Chapter 10. Or you can find my commentary on Chapter 8 here. I find the lack of authority to be the odd element. Authority builds things such as roads which we find in ME. Unless one argues that the authority that disappeared (the Northern Kingdom of men being one) built such things. I know this is given as explanation for some of the roads and buildings that are mentioned in the fellowship - it doesn't explain such things in the shire though. I find the lack of population easier to understand - men are in decline in ME which explains their absence. Same for dwarves and elves - the latter as immortals don't have a need to breed in great numbers anyway. And Hobbits being what they are don't lend themselves to great empires or numbers. Much to mull over again Matthew,thanks for another fascinating post. There is frequent mention in the later chapters, and indeed on the barrow-downs of the ruins of fallen kingdoms. So the empty wilderness studded with ruins reminds us of the exrent of what used to be and how much has decayed without beating the reader over the head. Hmm plenty to mull over on the night shift, professor sully, I must read these again, for inspiration in terrain building if nothing else. How cool would it be to fight over the ruins of weathertop in a 3rd edition game, or the town of Bree in a game of malifaux? Sorry to spam... but I wrote an article about this theme in my blog the same day as yours :D. It's written in Spanish, but perhaps somebody would find it interesting. This is the URL: Eriador es un desierto ("Eriador is a desert"). The theme of religion in Middle Earth is worth its own article, I agree. Concerning population... it's just unbelievable. There are some great figures about Eriador's population at the magazine "Other Minds" number 13, based mainly on this very chapter you're written about (including the "within a hundred leagues of the Shire" phrase). 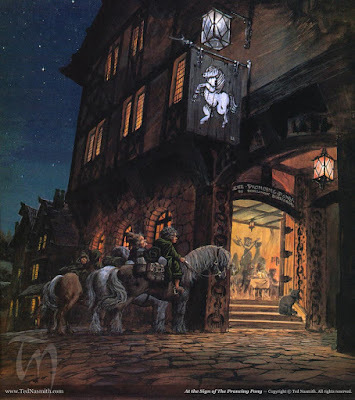 If I were to play a game at Eriador I would add some "human Shires" at Minhiriath, Enedwaith and the roads that go from Bree to Rohan, for example. The Rangers of the North must be protecting something! Insightful as always, congratulations. I tend to believe that this was part of Tolkien's own Arcadia, and that he purposely left many things untold; maybe not as much looking for other people to fill it as an attempt for the readers to focus on the story and feel themselves inside this big world, misterious and unknown as it was for the travellers, i.e., the hobbits, so making the reader feel the ambientation. BTW, Carlos, nice article too, I've enjoyed it a lot, thanks! Well met, at the Sign of the Prancing Pony! The discussion of politics and religion isn't quite suitable for polite company... so Tolkien leaves it out, and in doing so draws a nice defining edge around the subjects. 'There is an inn...' does a wonderful job of tearing-down, trampling upon, and setting fire to the fourth wall. It's all to easy to banish the poem to the category of silly Hobbit-talk. but it brings in The Silmarillion, Norse Myth, 17th Century Ballads, and Nursery Rhyme the "Man in the Moon" being Tilion from the Silmarillion who more than resembles, Mani from Norse myth - which is occasionally thought to be the origin of the folkloric figure who turns up on real-world pub-signs and nursery rhymes. This layering of meaning and intertextuality, along with the theory of story, is where Tolkien as a postmodernist writer comes into his own, but not in a high minded, serious, scholarly way, but in something of a jig. So I do agree Tolkien is more like history, insofar as history is construction built of a collection of texts that interrelate and overlap. On the other hand, maybe they all worship at the Church of Tashlan, in secret! Lawks! As far as religion is concerned, Tolkien always struggled (increasingly more so as he became older) to reconcile his act of 'sub-creation' (as he called it) with his Catholic faith and belief in God as the only true maker. This may be the reason why he never posited his own religion in Middle Earth and went to great pains to point out in his letters that Illuvitar is the only god and that the Maiar are lesser beings mistaken by mortals for gods. Interestingly, the only religion described in Middle earth is false and corrupt such as the worship of Sauron by the Dark Numenoreans. I'm not sure if anyone has any thoughts on this. In terms of what we can infer about religion in Lord of the Rings it seems to be entirely consistent with the Bible. Tolkien only describes the creation of the elves and dwarves (fictional races), never men. When the elves first encounter men it is as they are coming from the East after having suffered some unnamed catastrophe (the Fall?). Stories do many things for us but one crucial function is to entertain. For me this chapter is the point at which Tolkien takes it up a gear, perhaps shortcut to mushrooms but certainly by the sign of the prancing pony. Now I'm no great scholar of Tolkien, LoTR was my escape from study so I must say I had never dwelt to long on the issues you raise though I did find MERPs hamfisted addition of both religion and wide spread wizardly classes more than out of touch with the fiction. I had I guess always assumed that men had been driven out and were slowly returning, I also expect that Tolkien was as bad a geographer as he was great a linguist. That is to say he didn't really understand how populations and settlement patterns work. Any lack is as much through ignorance as design. Hey enjoying reading your thoughts. The lack of population makes sense. On the western side of the Misty Mountains, the two great empires Angmar and the Northern Kingdom of the Numenoreans basically wiped each other out. It takes a long time to repopulate (although there are definitely other cities, as people are coming up the old south road to Bree). On the eastern side of the Misty Mountains, the Fellowship are generally trying to avoid meeting people, so we don't tend to see what cities there are.